KLM promotional sale - cheap flights Dublin to Asia/South America €446! Cheap return flights to remote Bolivia from Paris for €489! KLM promotional sale – cheap flights Dublin to India/China from €348, South America €446! KLM, flag carirer of The Netherlands, is running new promotional sale on flights from Ireland to various destinations within their scope. Royal Dutch Airlines are offering their service to almost 130 destinations. 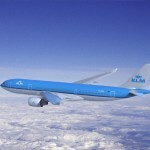 KLM, founded in 1919, is World´s oldest carrier still in operation. (flying under its original name). Nowadays they also belong to one of the safest airlines in the World. This time they are running an intresting sale from Dublin. You can book discounted flights to selected cities in China, India, Africa or South America. For instance you can book return flights to Beijing from €348, Mumbai €353, Cape Town €437, Sao Paulo or Rio de Janeiro €446, Bueno Aires €488 or Lima €508.. In case of booking or to check full list of discounted destinations of this KLM´s promotional sale just follow here directly to the website of the airline. KLM promotion is available from February to June and in most of the cases also September 2019 to January 2020. Blackout period around Easter and Christmas Holidays. Below you may find booking samples based on various booking agents. All Intercontinental flights with KLM are inclusive of all taxes and fees and in-flight meals. Some of the flights also include checked bag up to 23kg but depends on each route so check directly at KLM´s website before you book.. Note that this Air France / KLM “Dream Deals” sale is running only till 28th of February 2019. Booking sample of this latest KLM promotional sale – cheap flights Dublin to India/China from €348, South America €446! In this case you would fly from Ireland to San Jose in Costa Rica on 4th of March. You would return from Central America to the United Kingdom on 18th of March 2019.